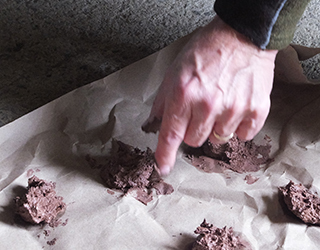 After a trial run in October, Land Steward Eric Owen and a crew of volunteers feel they have perfected the recipe for seed bombs and are ready to go into full production mode. Want to help? 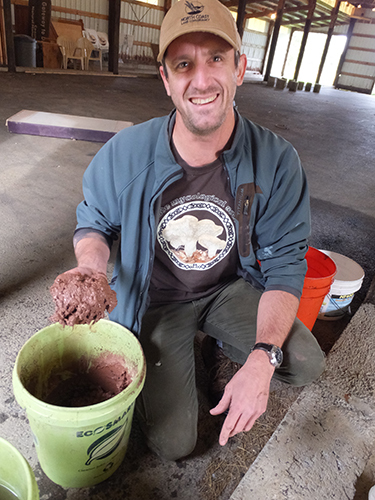 Seed bombs, AKA seed balls, are made from clay and soil with a sprinkling of native plant seeds. Ours are intended for our test plot in the coastal prairie at Reed Ranch, on the Clatsop Plains. Coastal prairie habitat is notoriously difficult to seed: the soil is mostly sand, and the seeds tend to get windblown before they have a chance to germinate. Placing seeds in a ball of clay and compost helps them stay in place long enough to germinate. Among the seed species going into our seed bombs are dune tansy, yarrow, dune sedge, early blue violet, California oatgrass, sea blush, Canada goldenrod, and red fescue, all of them native to the coastal praire. The ideal distribution of seed bomb is one per square foot, which translates to a total of 46,000 seed balls for the test plot. Clearly Eric needs your help! He doesn’t actually expect to produce that many, but the more volunteers he has, the more seed bomb they’ll be able to make for distribution this fall. He is also looking for volunteers interested in helping to place the completed seed bombs on the prairie test plot. We have lots of seed; any excess will be sown by hand in the prairie. Volunteers release dune tansy seeds from seedheads collected in the prairie.